Maine wedding musicians include everything from string quartets to country fiddlers. Wedding music is a matter of personal taste. Traditionalists having a church wedding might stick to an organist accompanying them down the aisle, or perhaps a formal string quartet. There is a growing trend in Maine and elsewhere to “tie the knot” in more casual settings, perhaps on the beach, in the midst of a forest or even at sea. Your decision on the perfect musicians, singers and/or DJs will no doubt be influenced by the locale you choose. Ultimately, the choice of music for your wedding and reception depends on what makes your heart, and that of your significant other, sing with joy and laughter. 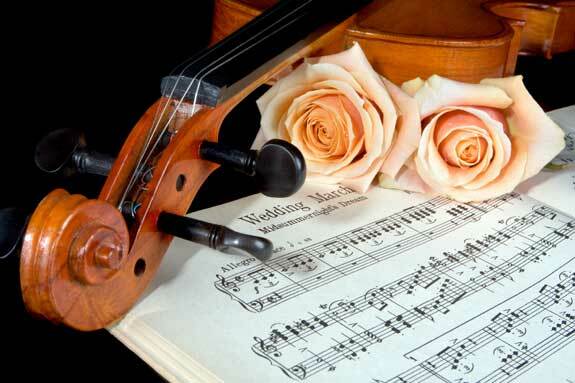 Wedding music sets the mood for your special day. It acts as an audio cue of sorts. Music switches the mind into sentimental mode for the ceremony itself and then transitions guests into a fun-loving party mode for the reception. Once everyone is ready, it is time for the Processional music accompanying the wedding party down the aisle. This could be a continuation of the pre-ceremony music. When the bride appears it’s time for the Wedding March, the familiar “Here Comes the Bride” song, played on your choice of instruments. Not all cultures and faiths use this song, for various reasons. In Celtic weddings the bride may be “piped” down the aisle with bagpipes. Music is sometimes softly played during the actual ceremony and at some point a soloist might sing something special. After the ceremony, music, again of your choosing, accompanies the bride and groom for the Recessional, or the walk back up the aisle as man and wife. The reception is a celebration of a different sort. Most are out and out parties with plenty of food, music, dancing and the traditional cutting of the cake. The choices for reception music are endless, from DJs spinning plastic to live bands playing the latest tunes. Much of Maine’s population is descended from immigrants from England, Ireland, France and other European communities. Finding an Irish band or French inspired fiddle music at a reception is just a pleasant fact of life in the Pine Tree State. Most of your wedding music professionals are in or around the major population centers such as Greater Portland, Augusta and Bangor. Some only perform locally, while others will travel throughout Maine and beyond. Since travel time is usually charged, it makes sense to choose a firm that is closest to your wedding venue. As an example, one band out of Bangor will travel up to 20 miles in any direction at no charge. After that it is $0.60 per mile, each direction. That same company charges $600 for a Protestant, non-denominational or a civil ceremony. A full Catholic wedding is longer, and costs $750. Receptions at this same firm are charged at $550 per hour. Using a DJ may or may not be less expensive. Pricing depends on the day of the week (Saturdays are more expensive), time of year, whether you are just booking for the reception or the wedding and reception combined. The price range could vary from close to $500 to over $2,000. Don’t forget about the travel time charges. If you are using a wedding planner, chances are that person will have the names of professionals they have worked with in the past. While last minute bookings are possible, most firms want a signed contract and the balance paid at least 30 days before the wedding. A non-refundable retainer fee is the usual policy. Like all wedding plans, the more research you do and the sooner you get your music booked, the better.